Targeting those serious players loyal to the look and feel of forged construction, but seeking more playability than a muscle-back, Titleist introduces the Forged 690CB irons in limited quantities. I've been playing these flawless irons for years. I'm able to hit the ball (Pro V1(x)), high, low, left & right with feel and control. I played blades since '82, and these stixs react and feel like them. I can spin the ball, or control the amount required for shots. Any Titleist irons you select, make sure they're fitted. This allows you to maneuver the shot properly. Nice clubs great responding irons! When I compress the the ball, distance with accuracy. The ball flight is mid- high trajectory. On windy days I like to play 3/4 punch and stinger shots and all I can say is wow cuts right through the wind. Would recommend for mid handicap and below. These are going no where. I moved to these Titleist irons from some Nike Slingshot game improvement irons, and I don't regret it one bit. I had to get used to them, which took about 2 rounds, but now that I'm adjusted, I'm striking the ball much more solidly and improving my distance. From a intangible perspective, the irons have given me more confidence that if I hit the sweet spot, the ball will do what I want. I recommend these for anyone who is looking to move from game improvement irons to players irons. I recently shot in the 80s for the first time with these and I'm looking forward to lowering my scores even more. ...played with this set for 8 years, tried to replace them many times, nothing better found. Solid, sweet, enough forgiveness, good looking, right trajectory and distance. Is there any other set that has progressive offset (more on longer, less on shorter), progressive bounce (less on longer, more on shorter) like 690CB? It is old, very old new. So, please suggest me what brand and model should I look for. Many of them, I own a pro shop. Ok to start with I love these clubs and have switched to these from a set of Titleist Tour model blades so can directly compare the two. These feel smooth and easy to hit with good shots going a mile and not a great deal of distance lost over bad shots. For those that say that hitting these feel like bricks? well I should do and get a real set as opposed to hitting the cheap copies you are obviously hitting. great clubs love em! The titleist 690 cb irons are a great sign of irons. I love them and If I were you I would never hesitate to buy these if u ever get the chance to ever buy them, do it. All the other irons that I have played are alot harder to control compared to these irons! 690's are great for control and they also work well around the greens. These are the finest forged cavity back irons I have ever played. They are forgiving if you are anywhere close to the center,not saying the whole face is sweet spot, but they are surprisingly forgiving. Simply open or close the face and they will fade or draw easily. Short irons are awesome for chipping and pitching. "Butter Soft"
Bought them for 179.00 used in 8/10 condition on ****. Save yourself hundreds of dollars and find these used - you will not regret it. Ive played several sets of irons over the last 15 years dci's. 845s, i3 blades, mp 14s and i can honestly say that the 690 cb's are as good or better than any i have held in my hand. These irons have every thing i look for in a iron minimum offset, thin topline, clean look at address, easy to hit off of any lie, consistant lenght, mid trajectory ball flight, great feel and they wear well. oh yea and they say Titleist on them. What more could you ask for. 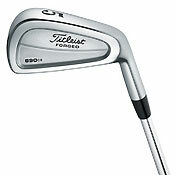 I keep trying new titleist irons but cant seem to find anything to rival my 690's. Great set of irons. Have hit newer models including the new Titleist CB. Just a newer version of this iron. Great feeling performing iron. If you look around you can get a set of these for a fraction of the cost of the new Cb. Titleist ap1, R7 Tp, X forged.